Press Boxes are an integral part of a grandstand that not only provide seating for coaches, press and announcers, but also enhance the aesthetic look of any venue. Press Boxes are an integral part of a grandstand that not only provide seating for coaches, press and announcers, but also enhance the aesthetic look of any venue. Whether you need to replace a press box on an existing facility, or need assistance in designing the right press box for your new facility, Sturdisteel can engineer an ideal solution for your needs. 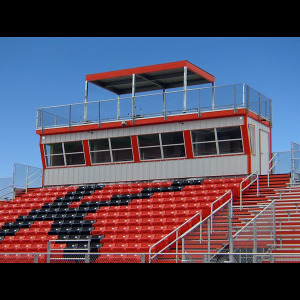 As a custom manufacturer, we design press boxes that meet your needs for both form and function. Using modern construction methods and modular designs we create an aesthetically pleasing press box that will hold up under the heaviest usage.